Iván Cáceres, a wonderful bongocero and friend to the bongo-playing community, passed away on March 12, 2004. He brought excitement to any discussion of our instrument, and brought awareness of Puerto Rico's rich contributions to music featuring bongos. 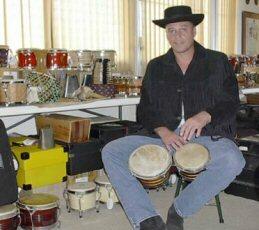 He created Bongolandia.com, which was a great resource for professional instruments and bongo information. Our hearts go out to Iván's wife and family. We will miss you Iván! Wherever you are, don't stop playing! Matthew Dubuque, for starting TheBongoGroup, and being a terrific provider of information to all bongo players, and for hooking me up with kind hosts when I visited Cuba. Willy Mollfulleda Jr., Luis Rodriguez, and Carlos Pimentel for helping me translate this site! José Carlos López of Baracoa, Cuba, for trying so hard to teach me nengón and kiribá! The participants of TheBongoGroup, too many to name individually, for all the tremendous advice, insight, and inspiration they provide to myself and each other! My partner Barbara, for putting up with the amount of time I spend working on this site!